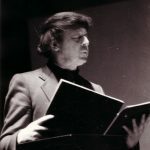 Anthony Burgess’s son Paulo Andrea (1964-2002), known in later life as Andrew Burgess-Wilson, played a number of wind instruments including recorders, the oboe and the English horn. Music was one of the ways in which Burgess and his son formed a relationship, with Burgess writing many piece intended for him to play, even though they were often technically demanding and rhythmically and melodically ambitious. This sonata for solo English horn is characteristic of Burgess’s writing for the instrument and is likely to date from the early 1980s, anticipating his more ambitious chamber works. Click the image for the full score (opens in a new tab).